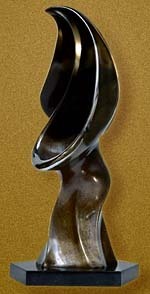 Size: 13.5" x 6" x 6"
This is the fourth in the Figurative series of Bronze sculptures concieved in the period from 1993 through 1994. It's been shown in various galleries and exhibitions, mostly in California, and has recieved some very positive reviews. The inspiration for this piece came from a waterfall in Glacier National Park in Montana called, "Birdwoman Falls." It's a piece that incorporates the mother with a place for a child, but the child is gone, and the woman evolves into a bird form, signifying the freedom that she now has. It was originally modeled in oil clay for a Moldmaking class taught by Holt Murray. A seven piece rigid plaster mold was taken of that, and a plaster Master was cast, which was finished up the polish needed to translate the sculpture into Bronze. A close-up of this is seen in "Reflections," the picture alongside "Art" on the home page. A polyurethane mold was made of this Master, from which the wax models are cast that become the bronze sculpture that you see pictured. There is also another Limited Edition cast in Hydrostone of 470 pieces available for $120 each. Bases are not included due to people's personal taste, but are available at $50 for a wooden base, and $100 for a Black Granite base. A Certificate of Authenticity and a Transfer of Original Artworks accompanies each piece.